Click the button below to add the Mimaki CG-FX Pen FPC Assy - E102500 to your wish list. 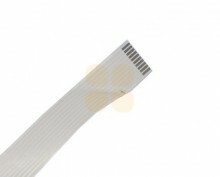 This cable is suitable for Mimaki CG-FX printers. This is the original Mimaki part (number E102500). This cable is 2160mm long, 14mm wide and has 10 pins.